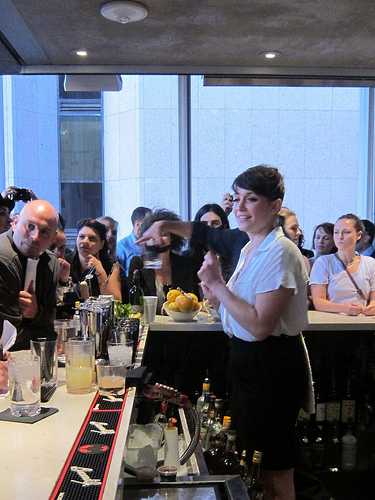 This past Sunday brought the city’s best bartenders to play. 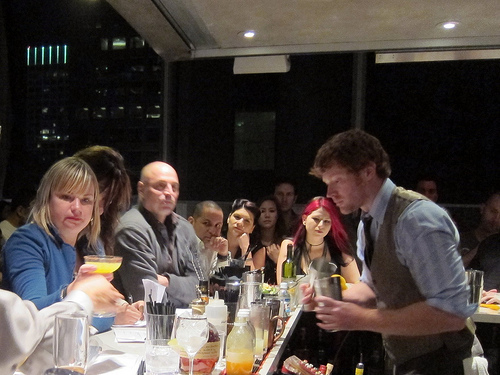 Table 20’s Second Annual Best Bartender Competition was held at Elevate Lounge in Downtown Los Angeles. The finalists were Joseph Brooke of Next Door Lounge, Devon Tarby of Varnish , Justin Pike of Tasting Kitchen, Daniel Zacharczuk of Bar | Kitchen and Brian Summers of Harvard & Stone. 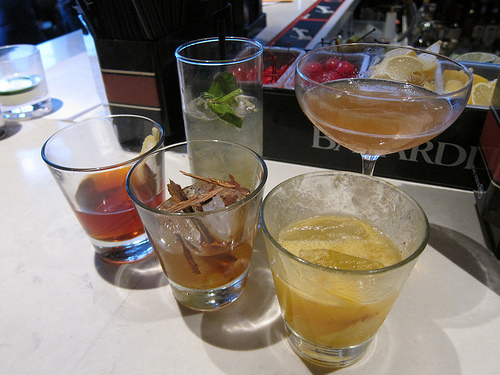 As part of the fun, we were given 7 drink tickets to try all five of the finalists’ drinks to select a People’s Choice Cocktail. Brian Summers with his Blues in Orbit won that prize. Daniel Zacharczuk went first. 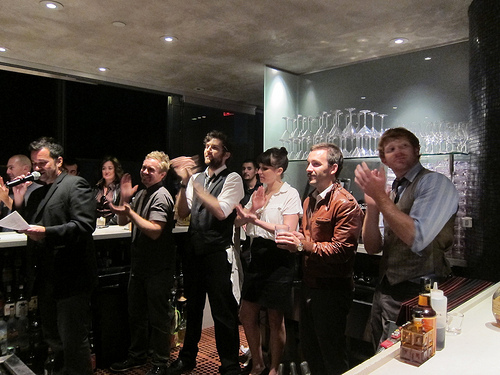 All the finalists had to make 6 cocktails in 20 minutes. Three cocktails were classics (judges chose from a list of 15 cocktails), two were the bartender’s original cocktails and one made with Karlsson’s Gold Vodka (one of the sponsors of the evening). 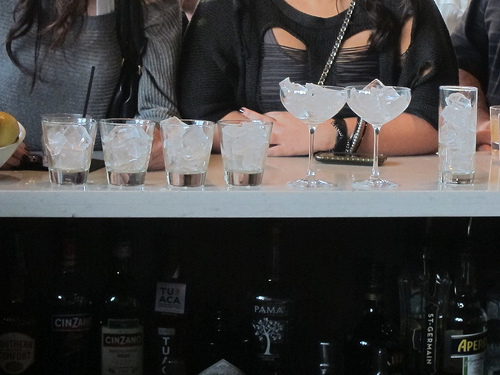 Daniel experienced some difficulty when one of the judges ordered a margarita and he had to make his own chipped ice by bashing it by hand. 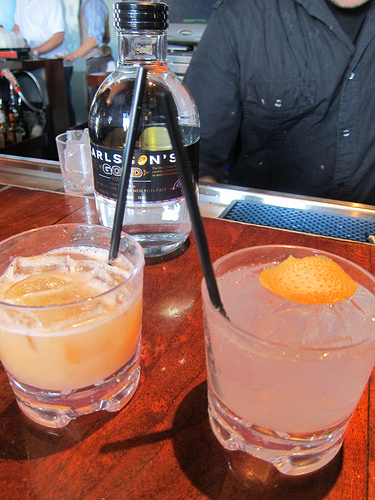 Loved that Daniel was able to sneak a drink to Ron of Lush Angeles and I after his round. He has my vote! Brian Summers was up next. One of the first things he did was ice down his glasses. Later I was speaking to Davidson Fernie, a fellow bartender at Harvard & Stone, about Brian and he says they call him The Palate at H&S. A great moniker for this happy bartender whose smile is very much a beacon in a dark bar. Some classics Brian made this evening were the mojito and negroni. The times I’ve been to the Varnish, Devon Tarby and bar manager Chris Bostick have always been behind the stick. Almost a year ago, I was at the Varnish as part of my Hot Bartender Crawl in DTLA and she didn’t laugh (well at least not to my face) when a friend of mine tried to order Bailey’s on ice. She made a fantastic drink and all was well with the night. Although I’ve never chatted with Devon, I felt naturally inclined to cheer for her because she had the best joke in this video. After Devon, Justin Pike stepped behind the stick. He was the most hospitable bartender I saw this evening. I’ve never had a drink from him at Tasting Kitchen but now I’d like to. He was also the most calm and charmed the judges by smoothly coming in right on the 20 minute mark. 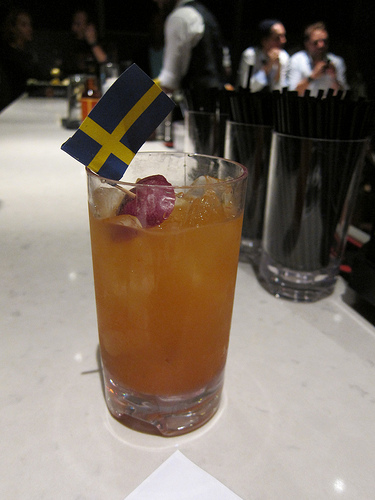 As part of his original cocktails, he brought a special barrel-aged cocktail he created. 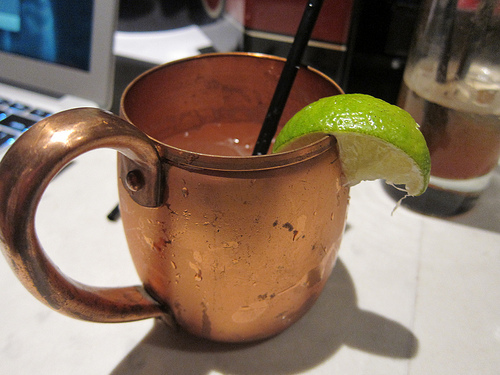 One of the classics he made was a Moscow Mule. Loved that he brought his own copper mug. 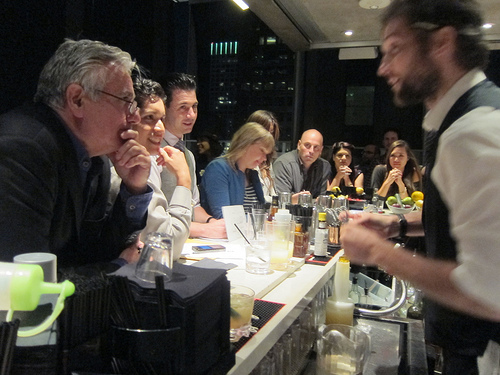 Another charming bartender, Joe Brooke, went last. He was also a finalist last year and there seemed to be a certain pressure he would win this year. I didn’t get a chance to taste Joe’s Spicy Strander at the main bar so it was a treat to snag a sip (after the judges, of course). And the winner is Justin Pike! Congratulations! 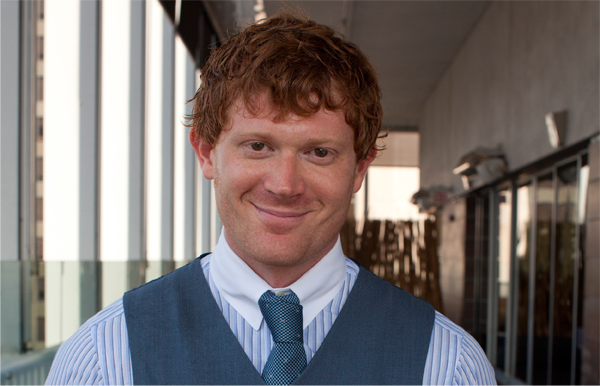 Justin’s face will be plastered on a billboard at Wilshire and Sweetzer (Mid Wilshire). It’ll be revealed on October 24. Next year’s competition promises to be an even bigger event spanning a few days. 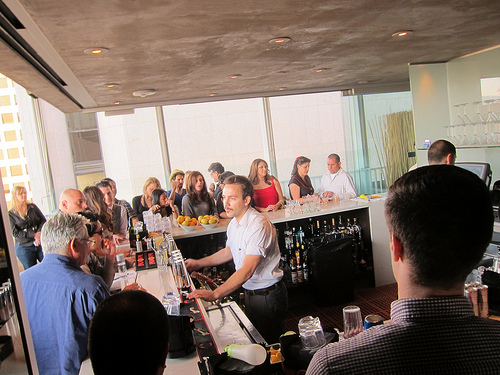 Could it be LA’s first cocktail fest? 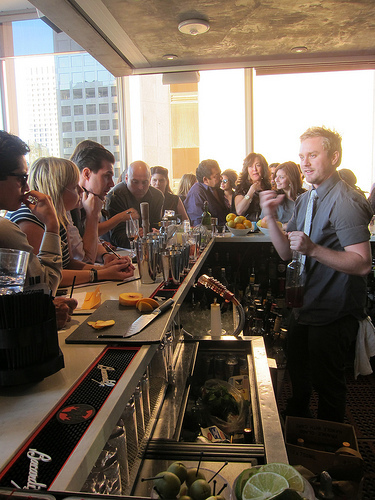 Trevor Smith of Table 20 promises demonstrations, amateur mixology events, classes and more. I loved the whole evening. Why isn’t it posted that Brian Summer’s won The People’s Choice as far as their specialty drink? Where can I get that drink again? ha, aren’t you Brian’s mom? Can’t he make it for you? But you can probably ask him when plums are in season again. And I do mention he won the People’s choice in the first paragraph. Unless you mean why didn’t Table 20 post it anywhere?